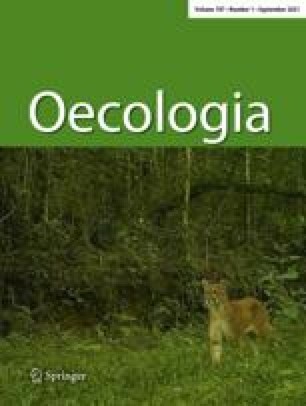 Landscape ecology, predominantly a terrestrial discipline, considers the effect of large-scale (tens of meters to kilometers) spatial patterns of habitats on ecological processes such as competition, predation, and flow of energy. In this study, a landscape-ecology approach was applied to a marine soft-sediment environment to examine rates of predation and transfer of secondary production in and around vegetated habitats. Seagrass beds naturally occur in a variety of spatial configurations from patches 1–10s of meters across with interspersed unvegetated sediments (i.e., patchy coverage) to more continuous coverage with little or no bare sediment. I designed experiments to address how percent coverage of seagrass in a 100-m2 area of seafloor, and the spatial arrangement (degree of patchiness or fragmentation) of an equal area (100 m2) of vegetation affected predation (lethal) and siphon nipping (sublethal) intensity on an infaunal bivalve, Mercenaria mercenaria (hard clam). Measures of seagrass density and biomass with different percent coverage of seagrass were also made. When clams were placed in both the vegetated and unvegetated portions of the seafloor nearly twice as many clams were recovered live with 99% seagrass cover than with 23% seagrass cover, while survivorship was intermediate with 70% cover. Cropping of clam siphons from both the vegetated and unvegetated sediments was also affected by the amount of seagrass cover in a 100-m2 area of seafloor: mean adjusted siphon weights were approximately 76% heavier from the 99% seagrass cover treatment than from the 70% or 23% cover treatments. Survivorship of clams placed within an equal area of seagrass in very patchy, patchy, and continuous spatial configurations was 40% higher in the continuous seagrass treatment than in either of the two patchy treatments. This study demonstrates that transfer of secondary production in the form of predation and cropping on an infaunal organism is altered as the percent cover of seagrass changes. While large-scale changes in the amount and spatial patterning of vegetation may affect habitat utilization patterns and foraging HGLoopbehavior, increased seagrass density and biomass with increased percent coverage of seagrass limit any conclusions concerning predator foraging behavior and feeding success in response to patch shapes and sizes. Instead, local changes in seagrass characteristics provide the most compelling explanation for the observed results.